The VPN Lab - Knowledge Base - Can Hackers Steal Your Info Through Public Hotspots? Public hotspots are one of the best things that have happened in the recent years. Of course, we are just kidding, there are certainly better, more useful things, but there is no denying that in this day and age, when it seems that almost everyone has a smart phone and the ability to connect to a public connection, these things are definitely major lifesavers. A public hotspot allows you to get necessary information from the internet, like the train timetable or a street address in an unknown city, to stay in touch with family and friends when traveling, even to do some remote work. These days, it seems that every establishment (bar, café, restaurant, shop, mall, theater, etc) has a public Wi-Fi hotspot. 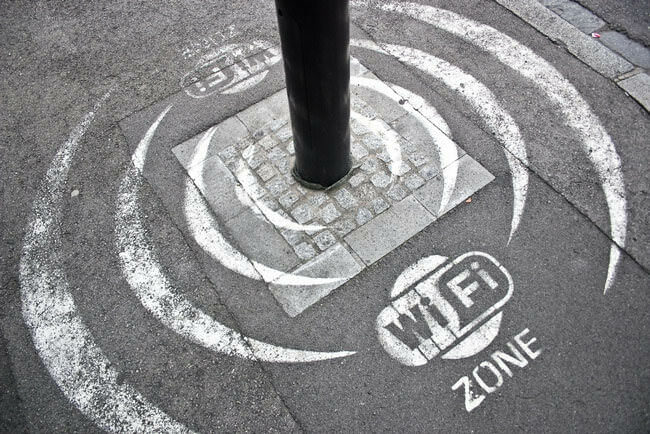 These public hotspots are omnipresent, but there is one thing many people don’t know about them (otherwise they wouldn’t be so eager to connect to them) – they are pretty unsafe. Public hotspots are the perfect target for hackers, snoopers and other not-so-well-meaning intruders. These connections are incredibly easy to hack and break into, and when that happens, all of your personal information, from your birthday, address, job and school information, even medical records, not to mention your banking information – all of this becomes exposed and easy to steal. Scary, right? So, let’s see how exactly these nasty hackers manage to attack and make use of a public hotspot. There are several methods, and one of the most common ones are the so-called MITM (Man-In-The-Middle) attacks. In this type of attack, the hacker basically sees all of the data that comes to and from your device. He (or she) can then alter it in any possible way, without you knowing anything about it, of course, not to mention they can use it for personal benefit or sell them to third parties. Another common method is called packet sniffing. It involves specifically designed software that can steal your data while you are connected to a public hotspot. In normal circumstances, this software is used by network administrators, who are, of course, authorized to use it and who use it for “normal” purposes. When hackers get a hold of this software, which is not very hard, to be honest, they can use it to spy on your traffic and pick up every piece of unprotected data that travels through it. The worst kind of public hotspot manipulation are the so-called rogue hotspots, which are basically hotspots designed to look exactly like legitimate ones. For example, hackers can set up a hotspot near, say, a McDonald’s, and call it “Free McDonald’s Wi-Fi.” If you are not careful enough, you will connect to it, believing it to be legit. Some rogue hotspots even emulate credentials and certificates of the hotspots you have connected to before, in a particularly deviant and sophisticated criminal act. If you connect to such hotspots, your data will be completely exposed, which is particularly dangerous if you use that hotspot to access your bank account. However, the good news is that this doesn’t mean you have to stop using public hotspots altogether. Like we said, these hotspots are incredibly useful, and fortunately there are ways to continue using them in a safe way. For example, if you are in a bar or a similar establishment, you can ask the employees to tell you exactly what their hotspot is called, down to the letter, in order to avoid accidentally connecting to a rogue hotspot. It also helps to only turn on Wi-Fi on your device when you really intend of using it, instead of letting it run in the background, picking up and connecting to who knows what suspicious hotspots. Finally, the best possible way to protect yourself when using public hotspots is to use VPN. VPN encrypts your traffic, sending your data through a protected tunnel and guarantees no one can intercept it or steal it. These days, VPN is very common and very affordable, and there are some excellent providers that pay particular attention to mobile device platforms, such as Android. You simply install the VPN software on your phone or tablet and you can finally relax and enjoy the Wi-Fi hotspots wherever you are in a safe, private manner, protected from hackers and other dangerous intruders.